Basements are imperfect concrete structures built in soils that vary from region to region. Water in the soil leaking into basements is a problem that has troubled homeowners for more than 100 years. This water will enter the basement through the walls, floors, and joints between them. Let one of our basement waterproofing experts come and give you a Free Estimate on permanently fixing your basement. We have been fixing basements in neighborhoods like yours for many years. There is no problem we don't have a solution for! 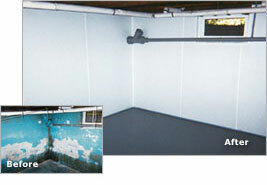 Through years of research, Basement Systems has developed the most effective and long-term solution for wet basements. We took the best concepts from common, traditional waterproofing methods and combined them to create the most innovative and effective system in the industry. Meet with one of our basement experts, and we'll show you how we can customize your waterproofing solution to keep the basement dry all the time! 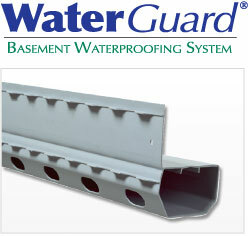 WaterGuard® is a specially designed drainage system (interior subfloor system) engineered specifically to solve basement water problems effectively without worry of clogging from soils under the floor. It has large holes in the back to accept water from the wall/floor joint and from under the floor, and a wall drain built right in! The non-clogging WaterGuard® System, together with a TripleSafe Sump Pump System, offer complete protection. Learn why old methods just don't work and why WaterGuard® is the answer. 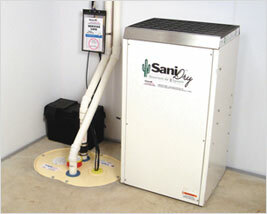 Prevent mold, reduce odors, clean the air, and eliminate damp basements! Basement Systems Edmonton services Grande Prairie, St. Albert, Sherwood Park, Grande Prairie, Spruce Grove, Camrose, Leduc, Fort Saskatchewan, Lloydminster, Wetaskiwin, Stony Plain, Lacombe, Cold Lake, Nisku, Bonnyville, Hinton, Westlock, and the surrounding areas in Alberta. Click to see our full service area! This involves "painting" the basement walls and floors with a waterproof coating that's meant to seal out the moisture. It applies directly to the concrete's surface with a brush or roller and is often applied when a homeowner is preparing for basement finishing. NOT a good idea! This involves digging out the entire perimeter of the basement outside, installing a new footing drain, and possibly adding a waterproof coating on the walls. This type of installation has been used for many decades—a drain of this type is generally installed when the home is built. Installs on top of the basement floor with a drain that runs along the basement walls. Collects water and sends it to a sump pump system. No jackhammering is required, and is the only appropriate solution for a monolithic basement floor. Installs underneath the basement floor, with a drain that runs along the basement walls. Collects water and sends it to a sump pump system. The system can receive water from the wall/floor joint, from underneath the floor and from the walls themselves.